Hi! Over the last couple weeks I've shared some of my favorite tricks for planning a story, bubble-mapping and drawing. Both of those are strategies I use for brainstorming and planning a story. 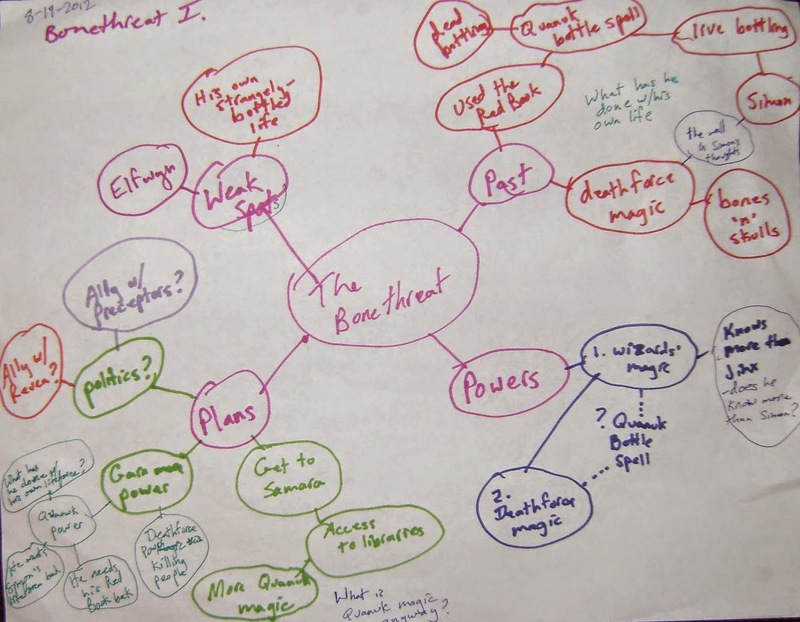 This next strategy focuses on organizing your ideas so that you're ready to write. 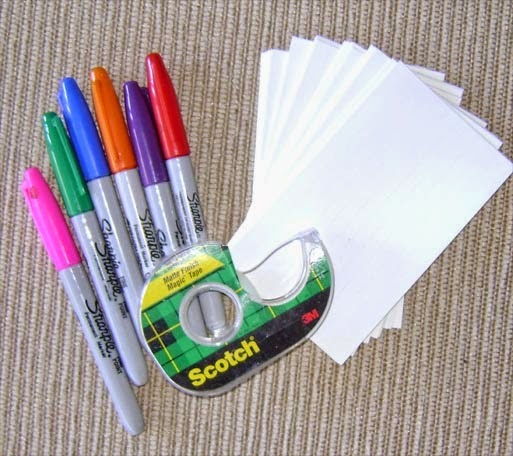 Equipment required: Colored pens, index cards*, and tape. It's likely that as you've thought about your story, some of the story's moments have become very clear in your head. Examples: Your hero meets her mentor. Your hero steals a golden apple. Your villain hacks into the NORAD computers, and thinks he's undetected. Write each of these idea-moments on a separate index card. Now look at your bubble-maps. (See last week's post.) Read through them carefully. Identify anything in your maps that looks like it should be a scene or a story-moment. 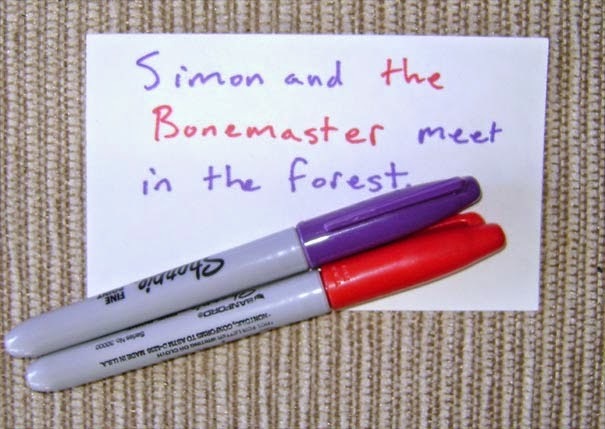 Make a separate index card for each of these story moments. Keep making index cards till you run out of scenes and story moments. Now, it's time to play with your cards. Sort through them. You'll notice that some of the scenes clearly belong at the beginning of the story, others near the end. Lay them out on a flat surface, in the order in which you think they might occur. The beginning of the story goes at the top, the end of the story at the bottom. If two or more ideas seem like they should happen at the same time, put them side-by-side. Keep moving them around till you think you've got them where you want them. You'll probably find some of your cards don't fit in anywhere. That's okay. It may be that those scenes don't actually belong in the story, or it may be that you'll figure out a place for them later. You may also find gaps. Don't worry about that right now either. When you think you have all the cards in the right order, tape them to the wall. Now it's time to fill in those gaps. Take some more blank index cards. Think about what scenes you might use to fill in the gaps. Jot them on the cards, and add them to the wall. Read through what you've got. Now look at the storyline for each of your main characters. (Just follow his or her color-code down the wall.) Do any individual characters have gaps? It's okay, for now, if they do. They may end up having gaps in the story. Just remember that you've always got to know where the major characters are, and, if they leave the story in the middle, you have to know what became of them. If a major character is left hanging, fill in an index card to show what he's doing. When your wall of cards is finished, you're ready to write. 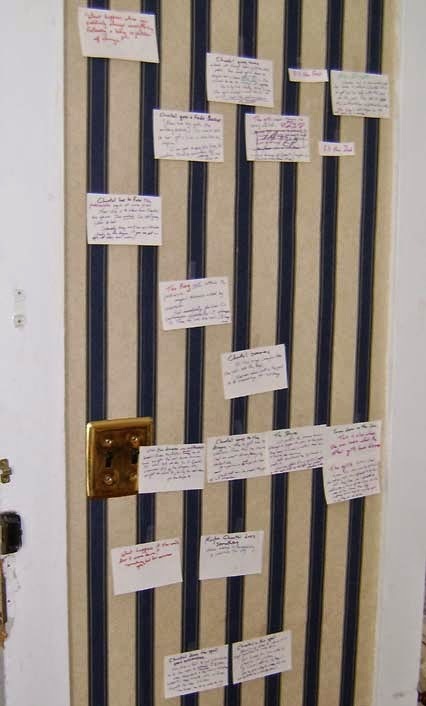 You can start writing your novel directly from what's on the wall. 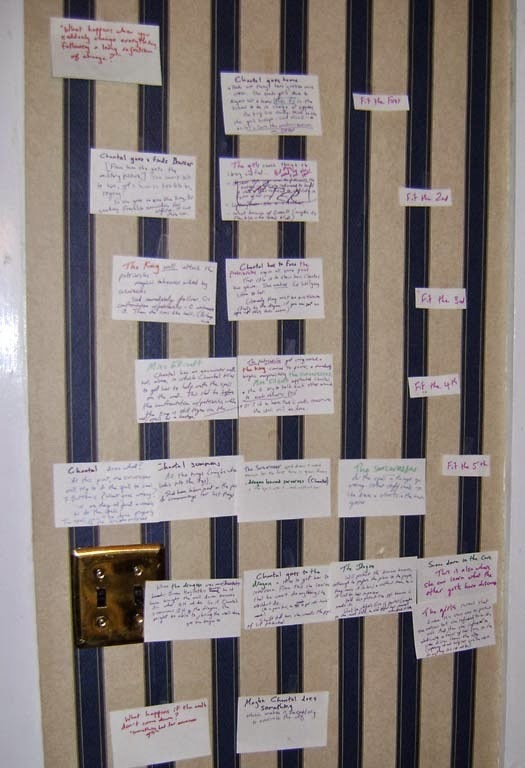 Or you can use your wall display as a basis for a traditional written outline. I've tried all of these, and they all work. And there you have 'em, as Casey Kasem used to say. My three main strategies for pre-writing a novel. I hope you find them useful for planning your own. 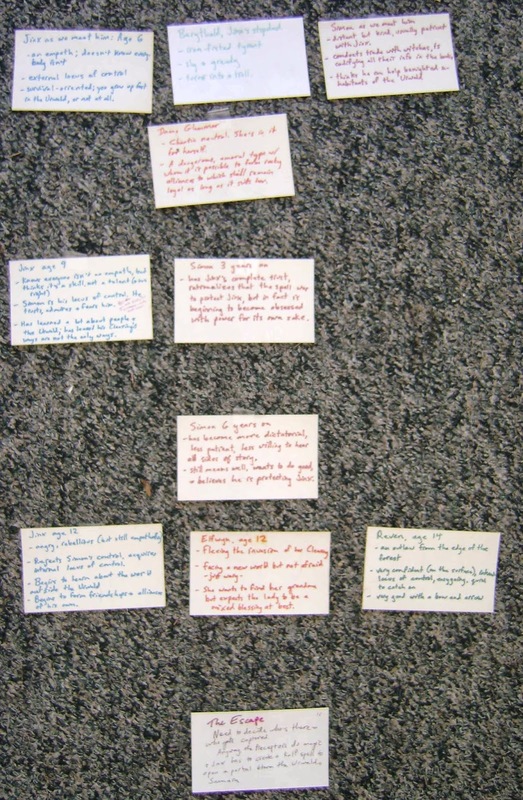 *Some writers use sticky notes instead of index cards. I like the index cards because they're sturdier, easier to rearrange, and cheaper. Hi! 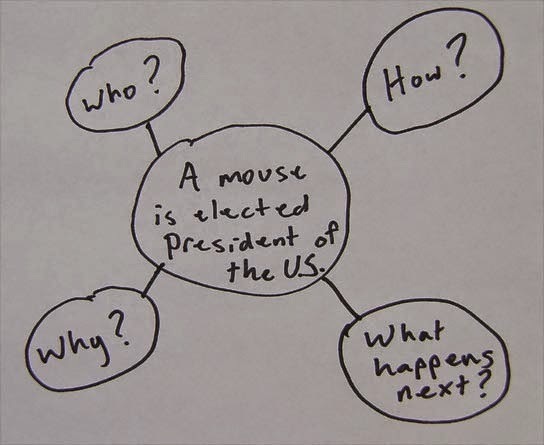 Last week I shared one of my favorite tricks for planning a story, drawing. I'm happy to have heard from several people that they've tried this and found it useful. 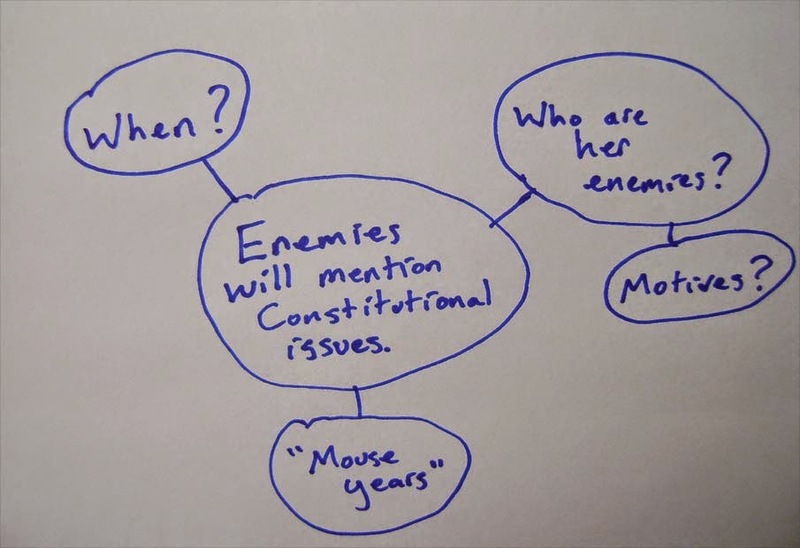 This next strategy, like the drawing, should enable you to plan your story without your internal editor getting in the way. It has various names; I call it bubble-mapping. Over the course of a novel I'll usually make about 100 bubble maps-- about 25 of them at the planning stage. Don't think too hard! Just let it flow. Keep going till you run out of space on the paper. By that time you should have discovered some interesting points that you want to explore further. Note the question "When?" in the new bubble-map. I'm already wondering whether this story takes place before the election, and is about Silvia's run (scamper?) 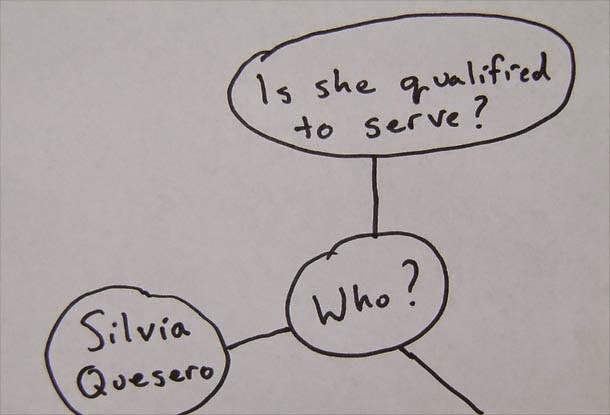 for the White House, or whether it takes place after the election, when Silvia's won in a landslide and the Secret Service has to outwit enemy cats and owls. 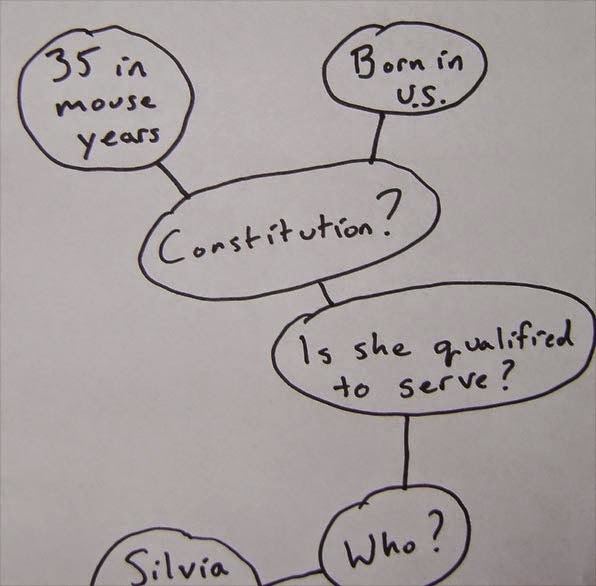 Is this a story about an election, about a constitutional crisis, about one mouse's struggle to change the world, or about an alternative USA in which a mouse is president? This was something I didn't think about till I started bubbling. I can make more bubble-maps to explore it, but I won't really worry about it till the next step of the process, which we'll look at next week. Hi! In my last post I promised to share a few tricks I use to help me get ready to write. I call them tricks because they all do the same thing-- they fool me into disconnecting my internal editor. None of them involve writing words that will actually appear in my book. I use all these tricks in the pre-writing planning process, before I begin a manuscript. They enable me (and hopefully will enable you) to forget about writing and focus on story. Doodling, sketching, scribbling, coloring. This is the very first thing I do to help a story come toward me. I draw pictures. I start out drawing the main character. Then I draw the other characters. I sketch in their surroundings, give them something to stand on, something to hold. 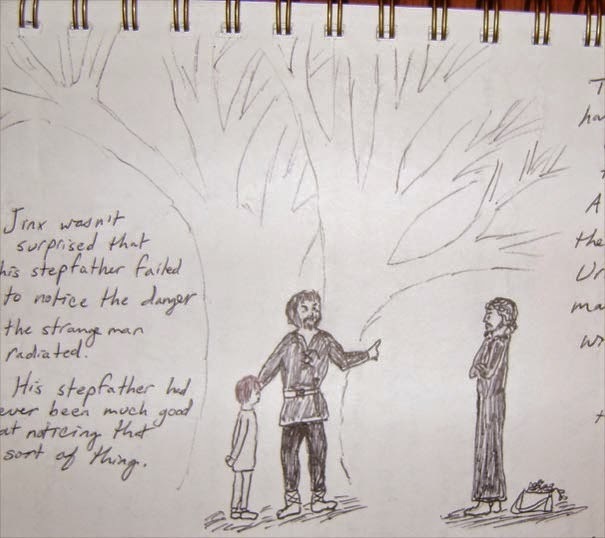 Every single sketch tells me something new about the story. Usually when I share this technique with other writers, they say "But I can't draw." Well, really, as you'll see below, I can't either. But that's okay! Nobody has to see your picture but you. And you're a writer, not an artist, so it doesn't matter if the picture's not of professional quality. If it will help, just draw stick figures. But do try it. Give it 15 minutes. If the 15 minutes go okay, give it another 15 minutes. You'll be surprised at what you learn about your story. As you can see, I wrote in a few descriptive sentences that occurred to me as I drew. These sentences didn't end up in the manuscript. Neither did the drawing, of course. 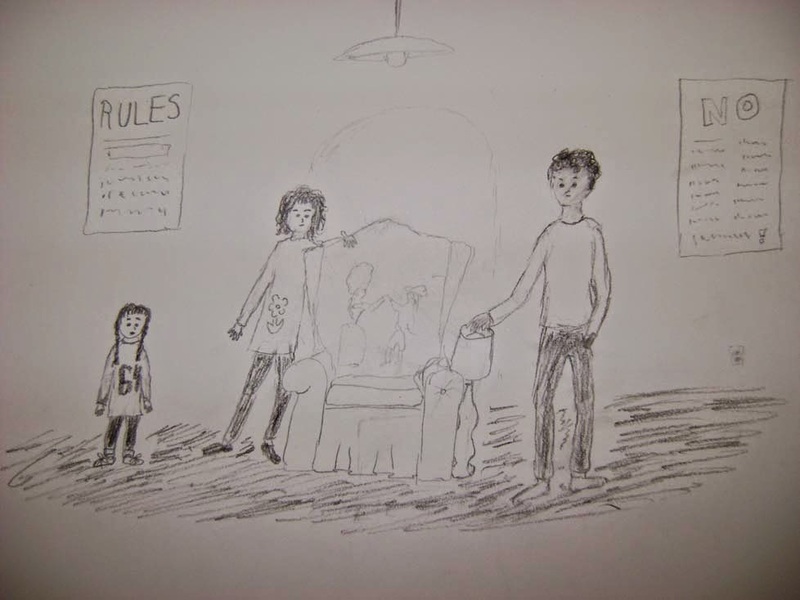 But the scene it depicted ended up in the first chapter of the finished book. In each picture, as I drew, the trees were becoming larger and larger. I began to realize the trees were going to play a very important part in the story, that they were a constant presence and had their own opinions. They even had laws. Here's a picture for a story that's been kicking around in my head. I don't know if it'll ever get written. Eh, so I have a little trouble with feet. Anyway, as you can see, the point here is not to produce great art but to completely free your mind from the need to Write Something. Draw to explore the world of your characters. Think about the story you're planning to write for NaNoWriMo. Imagine the main character. Draw him or her. Add some more characters to the scene. Draw their surroundings. In my next post, I'll share another pre-writing trick that I find even more useful than this one... and hopefully you will too. Watch this space! How to Plan for NaNoWriMo, part 1. Watch This Space! So, NaNoWriMo is coming up. NaNoWriMo is a challenge to draft a novel (or rather, to write 50,000 words) during the month of November. I took this challenge in November of 2009 and drafted JINX, which was published by HarperCollins in January of 2013 as the first book of a middle grade fantasy trilogy. NaNoWriMo is a good way to motivate yourself to write if you're having a hard time getting off the dime. But many folks who start out on November 1st just don't make it to 50k, and it usually seems to boil down to two reasons, both having to do with planning. The other thing that stops people from getting to 50k is that they hit a point – often around the 25k word mark-- where they run out of story. And I think this usually happens because they haven't done enough planning prior to November 1st. I have heard that writers are equally divided between planners and those who write by the seat of their pants, but I don't think it's true. I think pure pantsers are extremely rare, and that most writers need to plan to at least some degree. We may not necessarily want or need an outline of the kind we learned in school. But we need something. So if you're going to go for the gold this November, it would be a good idea to start planning now. Over the next few weeks, I'm going to be sharing some of my favorite planning methods. Hopefully you'll find something useful that you can incorporate.